Sculptor Joe Barrington, from Throckmorton, Texas, brings his unmistakable style and approach to art making to the next installment of the Cell Series. Barrington grew up in a welding shop in the Texas oilfields and was exposed to “hard work, hard living, and tall tales.” These and other experiences of life have shaped him and his work over the years and his materials are as raw and evident as those influences. Using what’s readily available paired with a keen instinct, he selects the most relevant materials to construct and illustrate his ideas and stories. The scavenged or recycled materials are not selected arbitrarily, but carefully chosen for their particular shapes and textures. He appropriates an oilfield storage tank to fabricate a skull due to its resemblance of bone. Tire treads mimic raven feathers due to their texture and color, and rusted raw steel resembles a bull’s hide. Being an artist, while staying in touch with the world from which he draws inspiration, demands Barrington straddle two worlds. Barrington makes aesthetic and creative decisions that go hand-in-hand with being an artist. Little Joe Hammer (the voice in Barrington’s head) serves as the “manly-man,” with no need for such “artsy” concerns. The persona of LJ Hammer is the granddad from East Texas who went to school three days total and is the skilled hunter, fisherman, and welder, as well as binge drinker. In other words, he represents the common man with all his faults and follies. More importantly, he is Barrington’s muse, albeit without the mythical robes and wings. 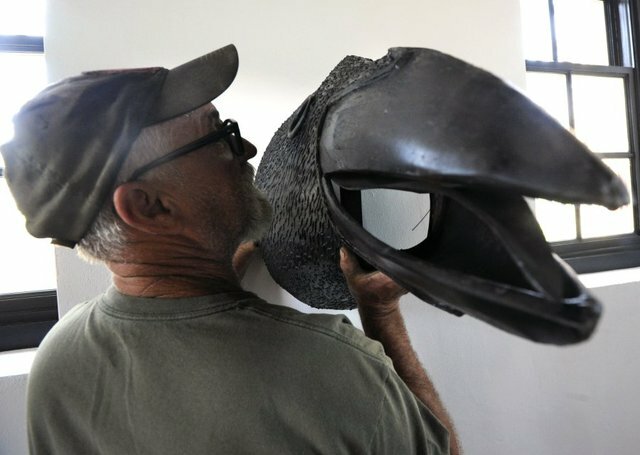 For his installation in the upper galleries of the museum’s 1877 jail building, Barrington continues his investigations and creations based on the raven. The raven has been a central character and symbol in the mythology and folklore of numerous cultures throughout history with its own varying roles, ranging from creator to trickster. With these multiple roles in mind, he fabricates a large raven figure in one of the galleries and a proportional raven’s nest in the adjacent. Barrington utilizes found and appropriated materials to construct the forms—much like a raven would do. The unexpected diversity of materials, the confronting size of the objects, along with the myth and legends associated with the subject are catalysts for amusement and contemplation. PK: Most people are familiar with your work that derives from utilizing found steel objects that you manipulate into familiar and recognizable objects, people, or animals. How far back does this approach to sculpture making go?